Last week, the Bureau of Labor and Statistics (BLS) reported that the unemployment rate for Post-9/11 veterans decreased from 6.7 percent in July 2015 to 4.7 percent in August 2015. 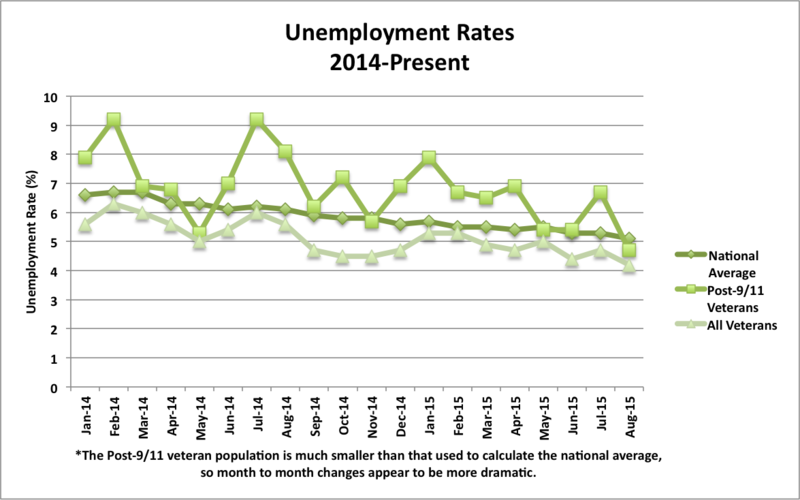 Among all veterans, unemployment rates decreased from 4.7 percent in July to 4.2 percent in August. 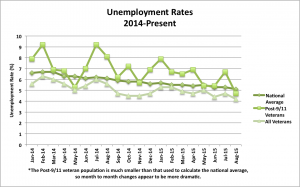 The national employment rate decreased from 5.3 percent in July 2015 to 5.1 percent in August 2015. This is good news for veterans and especially for the Post-9/11 generation, as unemployment rates continue on a steady downward trend. This is the first time that an unemployment rate below 5.0 percent has been recorded for Post-9/11 veterans since BLS began tracking this population in 2008. However, the dramatic change in unemployment rates among Post-9/11 veterans is partially due to a small sample size, as highlighted here in my previous blog post. The figure below shows unemployment rates among veterans, post-9/11 veterans and the national average from 2014 to present. As you can see, changes from month to month are often much more dramatic for the Post-9/11 generation. While unemployment trends are improving for the newest generation of veterans, there are many more who will be returning to civilian life in the next few years. Recently, I attended a roundtable discussion at the Department of Labor Veterans’ Employment and Training Service (DOL-VETS) office to discuss employment and volunteer opportunities available to transitioning service members. This program provides employment resources and expertise to help veterans and separating service members find meaningful career paths after service as well as working to protect veterans’ employment rights. At this roundtable, DOL-VETS staff highlighted some of the opportunities and resources available to veterans including AmeriCorps and the DOL Dislocated Worker program. Veterans and transitioning service members who are interested in community engagement can take advantage of AmeriCorps national service positions. 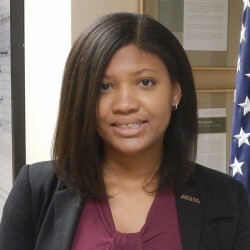 AmeriCorps volunteers receive a small living stipend and an education award that can be used to repay student loans or pay future education costs. These positions serve as a way to positively impact local communities and may assist with reintegration into the community after military service. Transitioning service members and recently separated veterans looking for employment may not know that they are eligible for the Department of Labor’s Dislocated Worker programs. The term “dislocated worker” includes groups of workers impacted by mass layoffs, plant closures and downsizing. Military service members and military spouses can also qualify. The Jobs for Veterans Act allows service members who qualify as “dislocated workers” to be afforded priority for services over those who are not veterans. Besides general resume and job search assistance, dislocated worker grants include funding for licensing and certifications in their new states of residence. For more information on this resource visit an American Job Center. These are just two of the many resources available to help recently separated veterans and service members transition to life after service. We encourage our veteran members to utilize all available resources in their job search after service, including our Rapid Response Referral Program (RRRP). If you are facing hardship due to being underemployed or unemployed, we encourage you to contact our team to get connected with resources to help you. Contact us directly by calling the toll free number: 855-91-RAPID (855-917-2743) or emailing transition@iava.org.